“Just picked my wheel up and I can’t believe the amazing job you guys have done. I honestly cannot see where the damage was and the wheel looks as good as new! 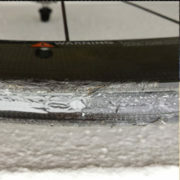 https://carbonbikerepair.co.uk/wp/wp-content/uploads/2017/04/ZIPP-wheel-repair.jpg 325 846 Rob Granville https://carbonbikerepair.co.uk/wp-content/uploads/2016/03/tumblr_static_cbr-1-131x300-131x300.png Rob Granville2017-04-19 15:52:202017-04-19 15:52:20ZIPP WHEEL INVISIBLE REPAIR!